"The Eagles! The Eagles!" he shouted. 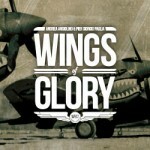 "The Eagles are coming!" Bilbo's eyes were seldom wrong. The eagles were coming down the wind, line after line, in such a host as must have gathered from all the eyries of the North. 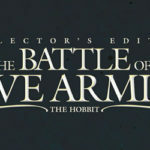 … and then Bilbo is surprisingly knocked out, leaving the reader, along with him, in the dark about the outcome of the battle… until it’s narrated to the little Hobbit in a sweeping flashback. 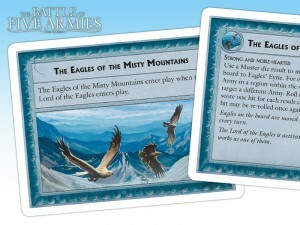 The Eagles of the Misty Mountains arrival is one of the events activated by the Fate Track. …long had suspicion of the goblins' mustering; from their watchfulness the movements in the mountains could not be altogether hid. So they too had gathered in great numbers, under the great Eagle of the Misty Mountains. … and “speeding down the gale,” they were able to dislodge the Goblins from the mountain. But, the battle could not be won – too large was the host of the Shadow – if not for the timely arrival of Beorn. Within the dynamics of our game system, it was clear the arrival of the Eagles should be one of the events activated by the Fate Track, after Thorin's arrival and before Beorn enters the scene. 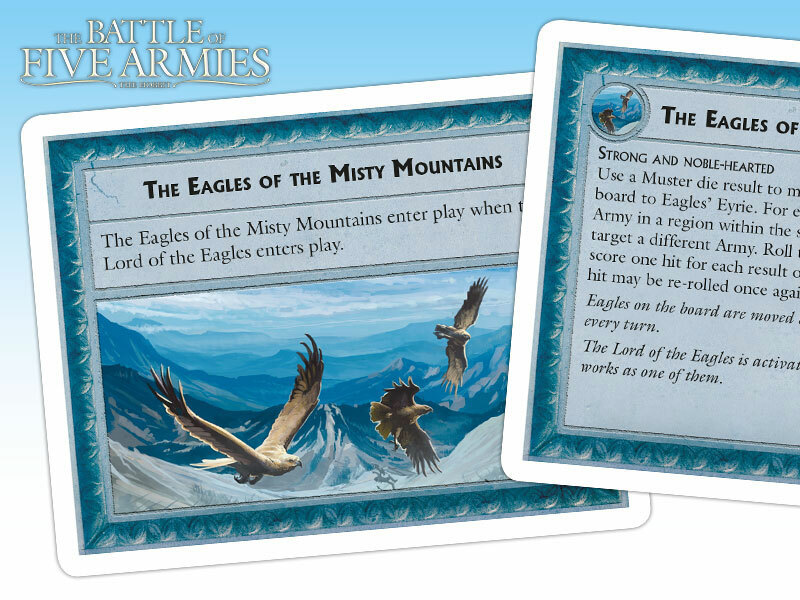 The Eagles can start to gather in the “Eyrie” – their mustering box – from the very beginning of the game using Event cards. Once the Lord of the Eagles is brought into play by the Fate Track, they can also be mustered by the Free Peoples player's deliberate action. 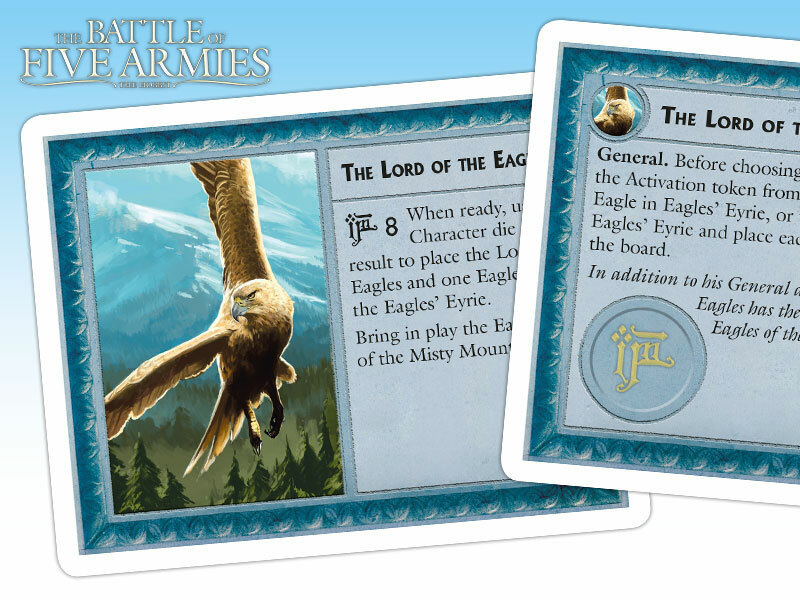 In fact, the Lord of the Eagles is one of the Free Peoples Generals, so it’s up to the Free Peoples player to decide whether to activate him and his General power at the beginning of a turn. He can then use it either to call more Great Eagles to the battle, or to launch them to attack the enemy. 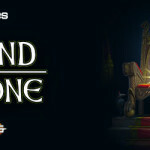 The Lord of The Eagles is one of the Free Peoples Generals. When commanded by their Lord, Eagles are moved out of the Eyrie and onto the battlefield. To represent the swooping assaults of the Eagles, they can direct their attack against any opponent in the territory (a group of region) they are in, not just in an adjacent region, as with normal armies. Multiple Eagle attacks can whittle away even a strong opponent, and their efforts can be combined with those of troops on the ground. The fast attacks of the Eagles cannot be fought back by the Shadow Army, but it’s difficult to concentrate them against one opponent. The Eagles will have to fly back and forth (represented by moving them back to the Eyrie, then onto the battlefield again) to do multiple attacks. 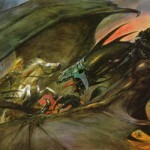 Bolg’s Army also has its share of winged allies to support the assault on the Lonely Mountain. While Eagles are very capable of killing Goblins, attacking with their powerful claws and beaks and throwing them from high in the air, the huge swarm of Great Bats accompanying the host of orcs, goblins, and wolves hinder and harass, more than kill, the Free Peoples fighters. “the great bats swirled about the heads and ears of elves and men, or fastened vampire-like on the strike,” as Tolkien wrote. 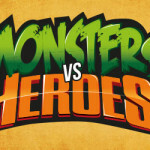 In large numbers, they can also form a dark cloud shielding the goblins from an altogether different kind of enemy – the direct sunlight that bothers them greatly. 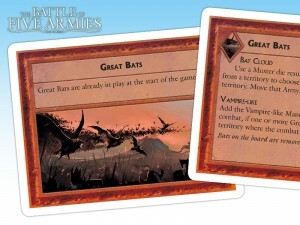 In the game, the bats are represented by specific figures, but they do not act in the same way as normal army units. 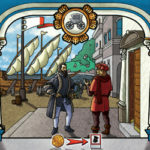 At the beginning of each turn, the Shadow player has a number of “command points” available, equal to the number of action dice. He must split these points between Leadership – used to boost the capabilities of his armies, in the same way as Leaders in War of the Ring – and bats. 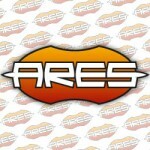 Each Bat can then be used during the action round, to activate the Bat Cloud ability. The morale and speed of the goblins is boosted by the darkness cast by the cloud, and, when under a Bat Cloud, they can move using a Muster die. While this ability might seem unimpressive at first glance, it gives the Shadow Host great maneuverability. They can move swiftly through the board in preparation of attack or secure key locations on the field of battle. Alternatively, a Bat can also be used during a round of combat. In game terms, this is represented by the Vampire-like ability of Bats. 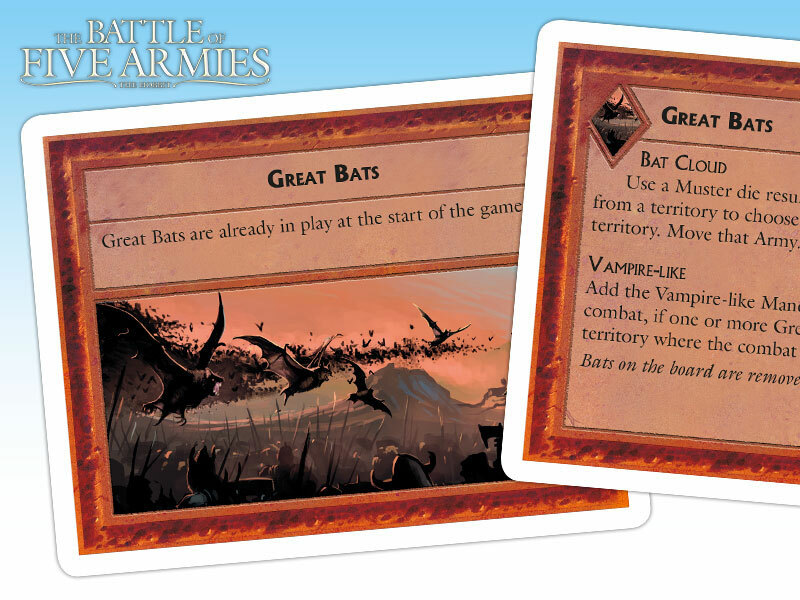 This maneuver card is added to the Shadow player's hand when the battle takes place in a territory where Bats are present. In a round of battle, instead of using the maneuver of one of the unit types present (or a standard maneuver like Regroup), the Shadow player may decide to “spend” a Bat and play its Vampire-like ability, inflicting additional damage to the Free Peoples army. Different from a normal maneuver, this ability can be used repeatedly as long as there are bats in the territory, slowly bleeding the strength of the opponent. Eagles and bats both provide players, in different ways, an additional level of strategy. The effect of these allies on the battle may prove decisive. 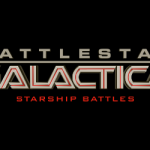 But they also need a little planning for best use, and they must be effectively coordinated with your ground troops, because they can never secure victory point locations by themselves. 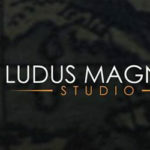 And now, we’re ready for our next and final article – we have a few more things we want to tell you, and we have the complete Rulebook in PDF.